You know what’s great about making a salad? The possibilities are ENDLESS! Sure when you go to a restaurant the ingredients are pretty set, but that doesn’t have to be the case at home. Even better, adding in super sweet, ripe fruits can be a wonderful way to introduce children to a salad they won’t turn their nose up at. Right now is a great time for peaches! Picking the right peaches is easy. Look for fruits that are fragrant and soft but not mushy. Skin near the stem should be yellow or cream colored, but not green. Let’s mix salty and sweet flavors with peaches this summer. Of course, start by washing your hands. But also wash all the produce. For this recipe, created by San Francisco Rubicon chef Stuart Brioza, we’ll be using peaches, arugula and basil. Try the ingredients before putting it all together so you and your little one can talk about how combining these flavors and cooking them changes each piece. Do the peaches become sweeter after grilling? How does adding pancetta change the peach’s flavor? Halve and pit two medium freestone peaches. Then cut into 8 wedges. Use 16 slices of pancetta — a cured meat similar to bacon. It’s pork belly that has been salt cured and spiced. Lay the pancetta slices out on a work surface. Set a peach wedge at the edge of each slice. Have your little one season with salt and pepper and top with a basil leaf. Roll up the pancetta covering the peaches. In a medium skillet, heat 1 tablespoon of olive oil. Add half of the wrapped peaches and cook over moderate heat, turning occasionally, until the pancetta is browned and crisp, about four minutes. Transfer to a plate and repeat until all the peaches are cooked. Then, lightly drizzle the peaches with aged balsamic vinegar. These can be eaten now, but let’s add a little more green. 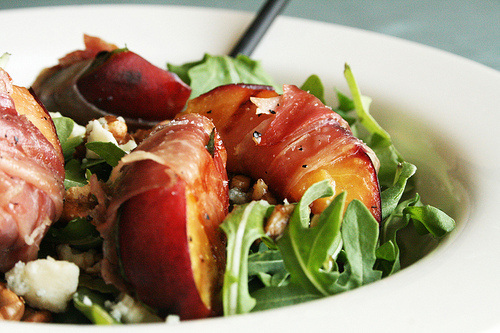 Place the peaches atop arugula salad with blue cheese crumbles and toasted walnuts. Blue cheese may be too strong for your little one’s palette. If that’s the case, add a mellower cheese like feta and enjoy! Try to work fast. The peaches are best when still warm.